Batching of solvent that is used to clean chassis prior to painting. 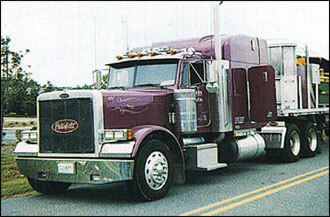 In the case of Peterbilt, the EPA allows no more than 32 ounces to be sprayed on each chassis. 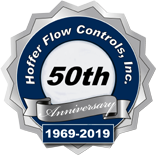 The Hoffer batch controller has reduced the amount of solvent used along with providing a verification method for the EPA. Must be highly accurate at low flow rate. Must only allow set amount per spray. Hoffer Mini-Flowmeter: MF½X100A-.06-1.6-B-1MC3PAX-MS Flowstar 2007A-X-R2-1-1-RF-X-DSR-1-HO/LO-NI-X The Hoffer Mini-Flowmeter and Flowstar Batch Controller were installed just outside the paint booth. Manufacturer set Flowstar 2007 to close a valve after 31.5 ounces of solvent have been dispensed via a spray gun. The operator is then required to press a reset button in the paint booth before the next chassis enters to initialize the Flowstar for another 31.5 ounce batch. Meter calibration is NIST traceable . Higher accuracy at low flow rate than paddlewheel meter. Use of Flowstar improves flowmeter linearity via linearization. The system allows Peterbilt to stay within the EPA’s limitations on VOCs in their production environment and to control usage of an expensive product. It also insures that the information supplied to the EPA on monthly usage is accurate and verifiable.